Do your legs ever get heavy or tired during a hockey game? Do you get slower out on the ice in the 2nd and 3rd periods? What if we could prevent that, and have you feeling fresh and fast for all 3 periods, while your opponents are all slowing down? Introducing our "Next Level Conditioning 2.0" Hockey Training Program! This is a full 3-phase hockey training system that is designed to whip you into tip-top hockey shape, so that you can be full of energy for your entire game - and ultimately dominate every shift you step out on the ice! One of the biggest complaints we hear from hockey players is that they feel great and fast in the 1st period, but they struggle to stay fast for a full shift and by the 3rd period their legs feel like they weigh 100 pounds each. Does this sound familiar? Don't worry you aren't alone. Hockey is an incredibly demanding sport, and even the best athletes can struggle with conditioning levels for a high-intensity hockey game. This is when the Next Level Conditioning 2.0 Hockey Workouts come into play. The 3 phases within the training program will build on each other so that by the end of the third phase you will be in the best shape of your life and be the player out on the ice that is blowing by players in the 3rd period! If you aren't familiar with the Energizer Bunny - the slogan for the bunny is that it "Keeps Going, and Going, and Going..."
When the other young kids were slowing down, I was still going 100 MPH, and because of that, I was scoring a lot of goals and well... dominating on the ice. As I got older I started to lose my conditioning levels. Just like a lot of hockey players deal with, I started to get heavy, tired legs later in games and I was no longer able to blow by players with ease in the 3rd period. And naturally, I started to dominate on the ice in the 3rd period again when most players were getting sluggish and slow. You too can get these same amazing results on the ice! 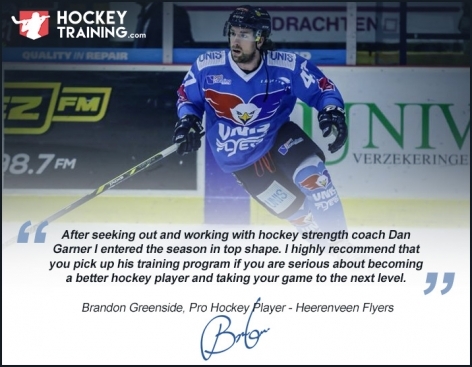 Coach Dan has put together the absolute best hockey conditioning program out there, that will turn any hockey player into a better player within just weeks! With the Next Level Conditioning 2.0 program, you are receiving a full 3-phase hockey specific conditioning program from a high-level coach. The full 3-Phase Next Level Conditioning 2.0 Hockey Training Program + bonus workouts is just $97! Yup, just $97 - less than what you'd expect to pay for just ONE training phase from a local trainer who isn't specialized in hockey training! Just click on the green button below to join us now and get started taking your hockey game to the next level with our Next Level Conditioning 2.0 Program! But that's not all you're getting! As a special bonus we've decided to include over $150 worth of hockey training materials in the member's area for you, at no cost! 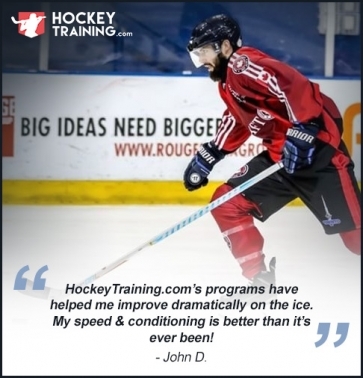 Our accelerated results package includes a series of hockey training manuals that will help you get even better results with your training! This is a bonus webinar that we ran privately for hockey players. It will teach you more about hockey conditioning training, and help you train like a hockey player! As an additional bonus you will also receive access to our "Hockey Skills Drills" program that includes off-ice skills workouts for stickhandling and shooting. This includes video demonstrations of each drill, and training sheets to follow for those looking to put in the extra skills work! 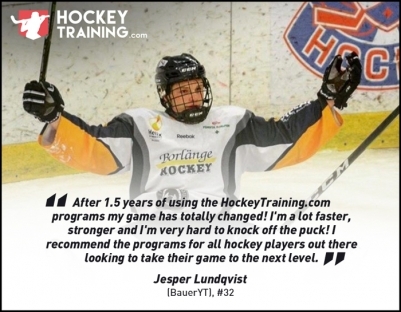 The Hockey Skills Drills program and Conditioning Webinar alone sell on our website currently for $76, and you're getting both for FREE, along with the other valuable bonuses! As with all of our hockey training programs, we stand completely behind this Next Level Conditioning 2.0 Program and are offering you a 60-day 100% money back guarantee. If you aren't satisfied with the training for any reason you can email me at Kevin@HockeyTraining.com and let me know. I will refund your full payment without question. That is how confident we are that you will absolutely love the program! Let's get you started now! Click the green button below! You are getting access to a complete "done for you" Hockey Conditioning Training Program. This includes 3 phases of conditioning training, which build on eachother so that by the end of the program you are going to be a completely brand new and improved hockey player. Each phase includes a schedule showing you exactly how to lay out your training, and exercise demonstrations so you know exactly how to do each exercise. For the hockey players interested in learning more about hockey conditioning training, we've also included a full 3-part guide that will teach you how to train your conditioning levels specifically for hockey and the "why" behind it. After reading this guide you would be ready to teach a class on hockey conditioning if you wanted to! But we've got a few bonuses for you today included in NLC 2.0! Whether it is the winter and there's snow on the ground, time is tight and you have to train at home, or you're traveling and at a hotel - whatever the case - these workouts are perfect for when space is limited! Coach Dan has created some great hockey specific conditioning workouts that will give you a great workout in a limited amount of space! These are some of my favorite hockey conditioning workouts to do when I can't make it to the gym. Do you know another hockey player that might be interested in training with you? We've added hockey team/partner workouts that can be done by 2+ hockey players. This adds in some unique hockey exercises that you probably haven't seen anywhere else. Not only is this training great for hockey conditioning, it can actually get competitive and be a lot of fun! These workouts are great for hockey coaches, but also just for any hockey player who can find a partner to train with. A large number of the exercises will require no equipment at all, but with that said, you should have access to equipment found at a gym. Here is some of the equipment needed to complete all workouts properly - box for jumps, medicine balls, and a dumbbell or kettlebell. Once you have signed up you will create a username and sign into the member's area. From there you can access and download all of the program's material. You will be able to watch the exercise demo videos from any device you have access to the Internet from. This program was designed for hockey players 14+. But because a lot of the training is bodyweight exercises youth players younger than 14 would be fine going through this training. We recommend players 13 and younger start with our Youth Hockey Training Program. 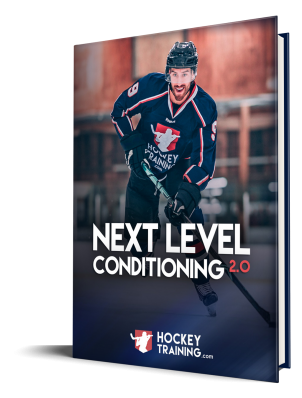 Note: The Next Level Conditioning 2.0 Hockey Training Program is a completely downloadable series of e-manuals and videos. No physical products will be shipped. After you order, you will get INSTANT ACCESS to download the product guides onto your computer (no waiting or shipping costs). The format for all manuals, workbooks, and checklists, is PDF, which can be viewed on Mac or PC, and even most mobile phones.